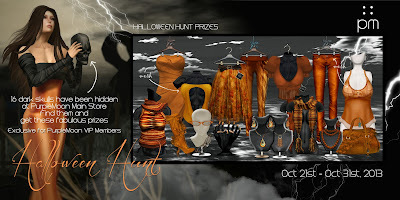 Halloween Hunt at PurpleMoon | ! *PurpleMoon Creations* ! Find them all and get the fabulous prizes you see on the poster! 2- The object you are looking for is DARK SKULL, like the one in the poster. 3- To receive the gift, simple touch the skull. You will be given an object that can be worn to unpack. 4- The skulls are numbered from 1 to 16. 6- The BIG SKULLS hanging of the ceiling are an indicator that there are skulls hidden in that room. 7- It is MANDATORY to HAVE FUN! and remember to activate your VIP tags!